Over the past couple years we have been noticing the braid gaining more and more popularity and evolving into new creative looks. From a simple side loose fishtail braid to Lauren Conrad’s bohemiam-esque braid worn on the crown of her head, to Blake Lively’s ponytail braid. 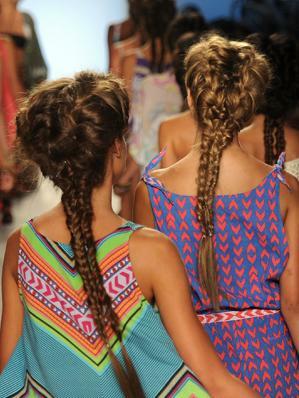 We couldn’t help but go braid crazy after seeing images from Mara Hoffman’s Runway show from this past Miami Swim Fashion Week 2012. The elegantly styled braid that the models beautifully showed off was a combination of a French and fishtail braid! We must say, by far, this is one of the nicest styles that we have ever seen. The mastermind behind the double fishtail French braid is Tresemme’s lead stylist, Elsa Canedo. Not only is it perfect for summer but it can be great for a day at the office and a night out as well! What is truly even better is that you will not need much styling before you start braiding your hair. Having some loose pieces really ties the whole look together. Oh, and not to ignore the beyond gorgeous prints that made an appearance on Hoffman’s bathing suits and cover-ups, the 39 piece collection was phenomenal! We are going to eagerly rush through fall/winter in anticipation for Egyptian and South American tribal printed suits next year!